A Sudanese government-controlled town in Darfur has been burned down and looted, the United Nations says. The town of Haskanita is the home of the African Union peacekeeping base that rebel forces attacked last week. The UN observer mission did not say which forces destroyed Haskanita. The Sudanese government has not commented. On Friday, rebels said Sudanese government troops were attacking the town in apparent retaliation for the destruction of the AU base. A statement issued on Sunday by the UN Mission in Sudan (Unmis) said an assessment mission to Haskanita on Saturday had reported "that the town, which is currently under the control of the government, was completely burned down, except for a few buildings". It said the market area had been looted and just a few civilians had returned in search of food and water. In a town that was previously home to 7,000 people, only the school and the mosque were left standing, Orla Clinton, spokeswoman for the UN Official for the Co-ordination of Humanitarian Affairs (Ocha) told the BBC's Amber Henshaw in Khartoum. The UN intends to send a second observer mission to the town. Suleiman Jamous, leader of the rebel Sudan Liberation Army (SLA) Unity faction, told Reuters many had been killed and blamed the government for the destruction of Haskanita. 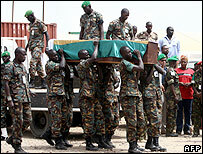 The Unmis statement said the civilian population had fled when the AU military base first came under attack on 29 September. Ten peacekeepers were killed in that attack, which the commander of the AU-UN peacekeeping force blamed on a splinter group "who broke away from a faction called SLA United". At least a dozen armed factions currently operate in Darfur. Next year the UN and AU will jointly deploy the world's largest peacekeeping force - 26,000 troops - to Darfur. It will absorb the current force of 7,000 AU troops, which has been struggling to protect civilians in the region. At least 200,000 people have died in Darfur during a four-year conflict and more than two million have been forced from their homes.